A New Haven Wedding Photographer experiences a wide variety of beautiful Connecticut venues. From Anthony's Ocean View, Amarante's Sea Cliff, ROIA Restaurant, the Omni New Haven Hotel at Yale, Union League Cafe, the Belvedere, and the Stone Hearth, there are a number of lovely spaces for a dream wedding experience. A New Haven Wedding Photographer must capture the beauty of the scenery, but also the singular moments that the bride and groom will want to remember in the years to come. 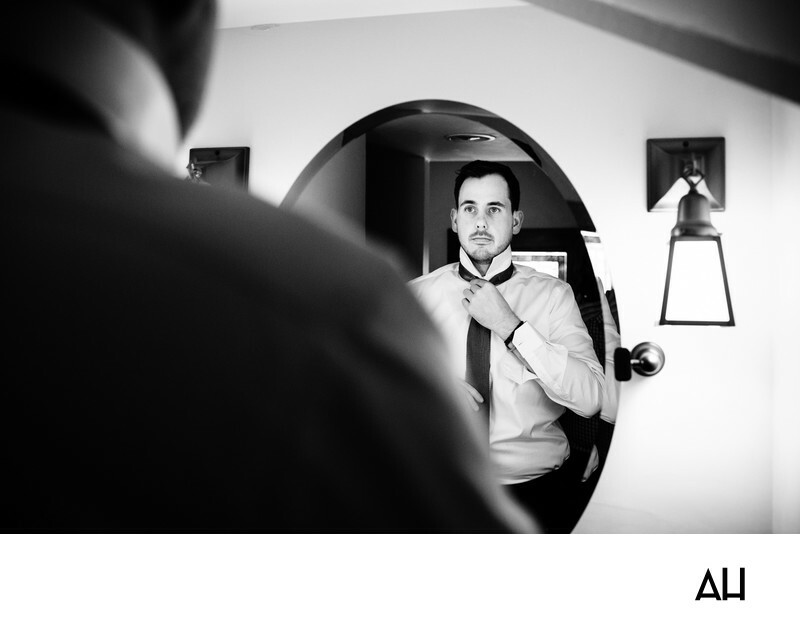 In this photo the groom is preparing for the ceremony in a room at his hotel. The black and white coloring of the picture draws attention to the contrasts in the image. The dark shades of the groom’s tie, eyes, and hair highlight the expression on his face. He looks steadily into the mirror as he fixes his tie as shadows dance in the glass before him. His expression is serious as he completes the task at hand, but it is also peaceful and confident. In just a few hours, he will be standing before his bride, pledging to love and cherish her for all of his days. As a New Haven wedding photographer, there are so many great wedding venues from Anthony's Ocean View, Amarante's Sea Cliff, Lawn Club Fine Catering, ROIA Restaurant, The Omni New Haven Hotel at Yale, Union League Cafe, Zinc, The Belvedere, Stone Hearth, and Knights of Columbus.